Quick Take: The Vampire Diaries, "The Hybrid"
Review: The Vampire Diaries, "The Hybrid"
Boy, was this one good. Damon and Elena finally hashed out their romantic status, Jeremy's ghostly encounters got a whole lot more confusing, and Caroline found herself in big big trouble. So let's dive right in! Poor Andie Starr. We hardly knew ya! As Damon watches the coverage of her death on TV, Elena makes another unannounced visit. Unfortunately for us, the elder Salvatore brother is fully-clothed. Sigh. Elena recaps her one-sided conversation with Stefan, but Damon doesn't want to hear it. He's convinced that Stefan is beyond saving, but Elena's not giving up that easily. She strolls on down to Alaric's room and asks him for help. He declines. Meanwhile, Stefan, Klaus, and a lifeless Ray are on their way to Ray’s werewolf pack in the mountains of Tennessee. More on that later. By this point you’re probably wondering what the heck happened to Caroline. After getting pelted with vervain darts, the sassy blonde is still MIA. At the Lockwood house, Tyler shares a breakfast with his mother (filled with vervain-laced coffee), then has to defend Caroline's honor after his mother calls her a prostitute. Oh no she didn't! Tyler leaves and heads to the Grill where he finds Elena and gives her some clues as to where she can look for a werewolf pack, which will hopefully lead her to Stefan. Apparently Tyler's been feeling guilty ever since he chomped on Damon, which ultimately led to Stefan's deal with Klaus to save his brother. Since then he's been very helpful in the Save Stefan campaign. With this new bit of information, Elena once again approaches Alaric about helping. When he refuses again, she threatens to go it alone. And Alaric, being the only adult role model, finally agrees to accompany her. Now that Jeremy has a job at the Mystic Grill, he and Matt seem to really be bonding. After their heart-to-heart last week, Jeremy approaches Matt about contacting the ghosts that have been haunting him, but Matt's hesitant about reaching out to the other side. Before Tyler leaves the Grill he runs into Matt and they finally tackle the big fangy elephant in the room. Tyler tells Matt that it was never his intention to ruin Matt's relationship with Caroline. It's also important to note that Tyler had a coffee at the Grill and noticed the same funny taste from the batch he had at home. When he mentions it to Matt, we find out that the sheriff slips vervain into the pots every so often. A light bulb goes off in Tyler's wolfy head and he realizes that his mom fed him vervain. Which takes us back to the plight of poor Caroline. Tyler's mom has been meeting with the mysterious Bill (Heroes' Jack Coleman), who's hell-bent on bringing Mystic Falls’ vampire population down by one. But Tyler's mom is feeling conflicted because she's known Caroline since she was in diapers. Decisions, decisions. Back in the mountains of Tennessee, we find Elena and Alaric already on Stefan's trail. While hiking, Elena offers Alaric the magical invincibility ring once owned by her father John. Begrudgingly he accepts and Elena wanders off to steal to moment to herself. But before she can do anything, Damon appears and throws her into the lake. He's not happy with Elena and tells her they need to leave before tonight's full moon. From there the two argue some more, but the mood quickly shifts when Damon reminds Elena about their last smooch. Opting to stand by her man, Damon finally relents and agrees to help her and Alaric find Stefan. Over in the hybrid werevamp assembly line, things are not going well. Ray has run off, causing Stefan to go after him and the other werewolves are bleeding from their eyes. Looks like Klaus may be missing a key ingredient in the whole hybrid transformation recipe. Perhaps because the doppelganger he thought he'd drained is still alive? Looks that way. When Stefan eventually catches up to Ray, the werewolf gives him a nasty bite, but Stefan's not too worried considering he has the antidote back at the campsite - Klaus's blood. But before he can return he hears Damon and Elena arguing in the woods. While he's distracted Klaus joins him (but doesn't hear Damon and Elena) and tells Stefan that he won't save him unless he brings Ray back. If you weren't convinced before, you are now. Klaus is not a nice guy. Now that Tyler's finally catching on, he confronts his mom about Caroline. When she doesn't offer up anything useful, he locks her up in a protective cage so that she can witness his werewolf transformation. See Mom - I've got secrets too! So after seeing what her son really is, Tyler's mom quickly changes her tune and tells that big meanie Bill that she was wrong about Caroline. Since Stefan unfortunately let Ray get away, the hybrid has found some easy bait in Elena, Damon, and Alaric. As the sun continues to set, Ray's transition is getting closer and Elena makes the astute observation that they all need to get the heck out of there. But by this time it's too late and Damon has to lure the wolf away from the others. Worried about Damon's safety, Elena tries to go after him. Wanting to protect Elena (and probably himself), Alaric gets the two of them back to the car where Elena convinces Alaric that she and Jeremy need Alaric. He's not a lost cause, just lost. While all of this is happening Damon is quickly becoming a werewolf biscuit. But before the hybrid can make Damon a meal, Stefan comes up from behind and stabs Ray. Even though Stefan just saved Damon's life (again), there's no celebratory hug or high-five. Stefan tells Damon no leave him alone and focus on keeping Elena safe. Before the three depart, Stefan gets one last look at Elena. It's killing him to stay apart from her, but he knows it's his only choice right now. He wanders back to Klaus and a pile of dead hybrids. Klaus goes over the ritual again; trying to figure out what could have possibly gone wrong, but thankfully he doesn't figure out that Elena is still alive - whew! Stefan and Klaus leave the mess behind and head for their next destination. Back in Mystic Falls, Matt finally warms up to the idea of contacting Vicki. With a few personal items on hand the two attempt to speak to the dead - and it works! Vicki appears and tells Jeremy that he can help to bring her back. But before Jeremy even has time to process this new information, a window breaks and Anna appears. She's also got a message for Jeremy. Don't listen to Vicki. Hmmm, very interesting. And over in Elena's room, Damon appears and tells Elena that Stefan isn't beyond saving. Then Damon asks Elena why she didn't follow through with the plan to save Stefan after Damon distracted the wolf. Elena tries to avoid answering but ultimately admits to Damon that she was worried about him - translation: on some level, she cares about him. The walls keeping Damon and Elena apart are slowly chipping away. Now for the shocker. We finally see poor Caroline chained up in some dank dungeon/cellar. Bill enters the room and you just know he's going to tell Caroline that she's about to be dust. Instead, Caroline glances up, a look surprise creeps onto her face, and she utters once word. Daddy? I know! How crazy is that! I hope you enjoyed "The Hybrid." I know I sure did. See you next week when we flash back to Stefan's past, and hopefully get some answers to this new revelation about Caroline's father. Wow, a lot going on in Vampire Diary land, great job covering it all kirby ! Thanks Eric! It's a wonder the creative team behind The Vampire Diaries can keep it all straight - so much good stuff happening right now. And how hot did Nina Dobrev and Ian Somerhalder look at the Emmys? Gorgeous! Can't wait for next week's episode! 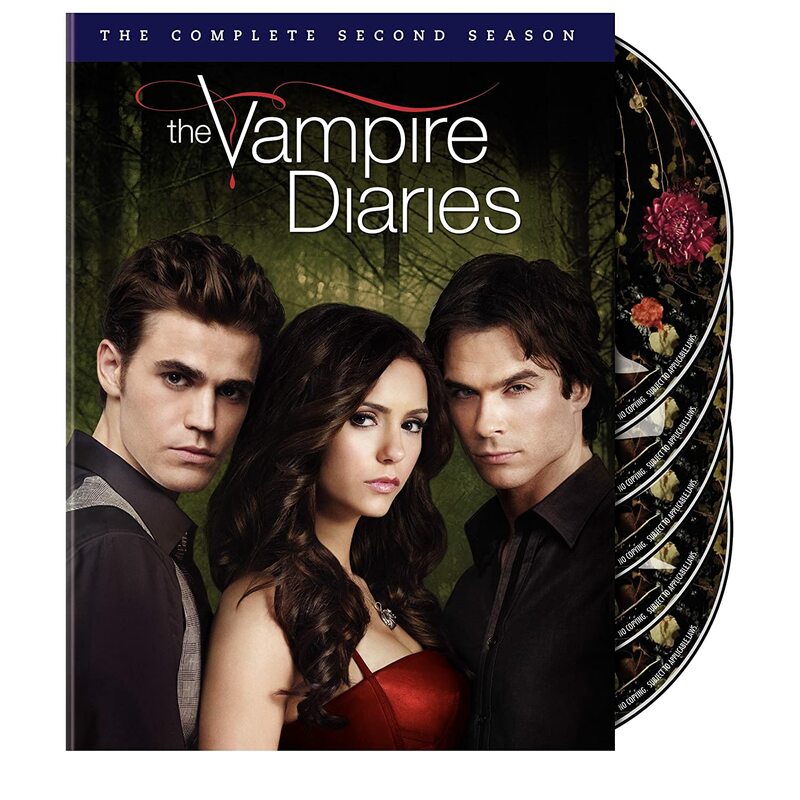 hey damon,elena,stafan.we love you guys am crazy abt vampire diaries.